By Jerry Camarillo Dunn, Jr.
To look at him, you might think he’s just another guy loafing around an Ojai coffee shop, staring into space. But if you could peer inside his head, you’d see that he’s hard at work. 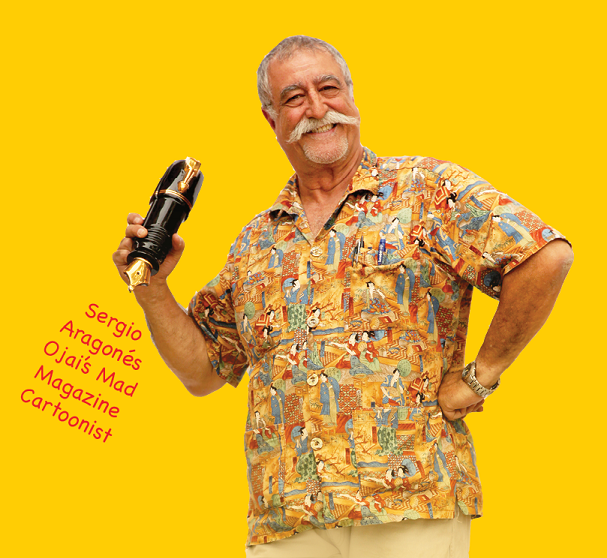 Sergio Aragones is a cartoonist. That chortling you hear as he doodles on his napkin? It means Sergio just thought of another gag for MAD Magazine, where he’s been a creative force of nature for more than 50 years. MAD was the nation’s top market for silly pictures, but the 24-year-old cartoonist screwed up his courage and appeared at the magazine’s office. The editors took his samples into a little room . . . and there was a deafening silence. But at last Sergio heard guffaws of laughter echoing off the walls. His cartoons were a hit, and they’ve been off the wall ever since. The editors assembled some of Sergio’s wordless gags into a two-page story about the U.S. space effort. One drawing showed a space capsule in orbit with a dismayed astronaut in the window, watching a paper airplane sail past. “I wanted to sell MAD more drawings,” Sergio recalls, “and I saw all the empty areas around the borders of the pages.” So began the legendary “Marginals,” gags that Sergio tucks into the white spaces throughout the magazine. The only thing not marginal is the humor. Sergio characterizes himself as a “writer who draws,” and each Marginal is a short story in itself — like the drawing of a bearded psychiatrist so absorbed in taking notes that he doesn’t notice his patient leap off the couch and out the window. MAD’s editors thought the Marginals were a cute idea but couldn’t last long. They told Sergio, “Well, we’ll publish them until you run out of ideas.” Since then his work has appeared in every issue except one. (“The post office screwed up.”) Over nearly five decades, he has drawn thousands upon thousands of his trademark wordless gags. In fact, Sergio is reputed to be the world’s fastest cartoonist. He is definitely the most honored, having won every major award including the National Cartoonists Society’s Reuben, which is the Oscar of the field. He also developed his imagination by playing make-believe, but in a way most kids could only dream about. His father was a movie producer at Mexico City’s Estudios Churubusco. “Whatever movie they were shooting, that’s what I played. If it was cowboys and Indians, I’d go to the prop department and get myself a big hat and a set of guns,” Sergio says. “The western town was my favorite. In front of the cantina was a railing for the cowboy actors to tie up their horses. When there wasn’t a movie being made, I loved to go there and challenge invisible bad guys. I’d come banging out through the cantina doors, get shot, flip over the railing with my legs in the air, and land in the dusty street. Then I’d do it again and again — because I was a kid! When Sergio announced his intention to be a cartoonist, his father was terrified because cartoonists don’t always make a great living. At age seventeen, though, Sergio started selling his work professionally when an art teacher sent his drawings to the Mexican humor magazine Ja-Ja. “I realized that cartoons have to be published for people to enjoy them,” he says. He also realized that America offered a much larger market than Mexico for his drawings. Soon after his arrival in the U.S., Sergio began writing scripts for comic books — ranging from House of Horrors to Young Romance — for the top publisher in the field, DC Comics. By the early 1980s, he decided to launch his own comic book. With Groo, Sergio took up a new artistic challenge. He explains the differences between his two chosen formats: “Comic books are a mix of storytelling and drawing — sequential art, panel after panel. A cartoon is a compressed idea; you simplify it to the maximum. You can tell a story in a whole comic book, or take panels off until you have just one. Then take the dialogue off, and in one panel, without words, you have a whole story! That’s why I think pantomime is very impressive. Sergio’s artwork in Groo may start with a “splash page” depicting a medieval village, hundreds of people in different kinds of garb, animals, wagons, tools, and weapons. All the details are painstakingly researched for accuracy in National Geographic and the cartoonist’s library of visual reference books. Sergio also sneaks in his own feelings about issues of the day. “A comic is a great vehicle for helping: pollution, deforestation, women making less money than men, and other social problems. You realize you have a good platform for making a comment, and you use it. These days Sergio also works as a guest artist for The Simpsons comic books, writing and drawing whole issues by himself. And he’s writing a series of tales from his own life, a sort of comic-book memoir called Sergio Aragones Funnies. “I’m fortunate that I’ve met a lot of remarkable people,” he says. The stories depict his encounters with everyone from Richard Nixon to a high lama in Tibet. One story tells about meeting the famous cellist Pablo Casals in Acapulco. For many years he visited far-flung places such as Kenya, Paris, Hong Kong, Tahiti, and Venice with the staff of MAD. The publisher, Bill Gaines, organized a free trip every year for the magazine’s regular contributors — the cartoonists, writers, and editors listed on the masthead as “The Usual Gang of Idiots.” Once, when they traveled to Haiti, Gaines had the whole group driven directly to the house of the magazine’s one and only Haitian subscriber, where he formally presented the baffled man with a renewal card. Sergio is a familiar figure around Ojai, usually dressed in shorts, his guayabera shirt untucked and pockets bulging with pens, his gray hair in a ponytail, his familiar moustache as wide as his smile. Greetings follow him down Ojai Avenue, and everyone feels they know him. The cartoonist did one thing that museums definitely frown on: He drew all over the walls. “One of the basic ideas for a MAD Marginal is the corner cartoon, where the borders of the magazine connect,” he explains. “Something is coming from one way, something is coming from the other way, and you know what’s going to occur if they meet: A criminal is trying to hold somebody up on the corner, and a bunch of policemen are coming from the other corner. Your imagination fills it in. On a narrow wall Sergio arranged three of his framed awards in a vertical line. But he hung the fourth one cockeyed and halfway down to the floor. Then he took a black marker and drew cartoon “speed lines” down the wall to show that the frame was falling. Below that, he drew a guy getting whacked on the head with a corner of the frame. Sergio often subtly incorporates Ojai in his MAD cartoons: the Arcade, Starr Market, a kid on the street wearing an Ojai T-shirt. “Every chance I get!” he says, chortling.